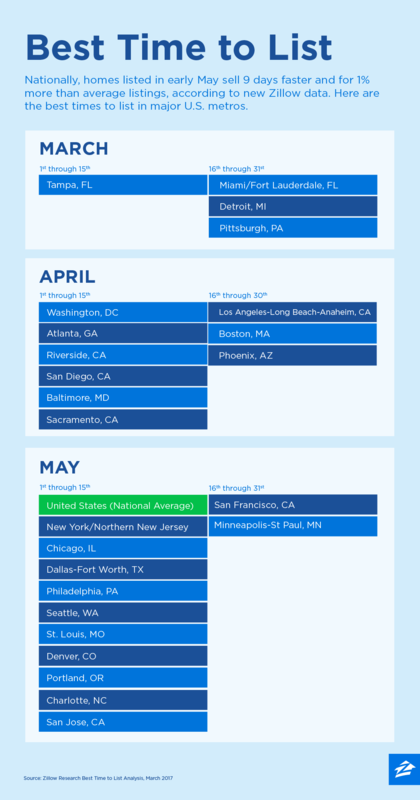 In all but five of the country’s 25 biggest metro markets, the best month to put a home on the market is April or May. Homes listed in the first half of May sold nine days faster and for almost 1 percent more money than average listings. By May, some buyers will be anxious to avoid more disappointment or eager to get settled into a new home before the next school year — and will be more willing to pay a premium to close the deal. The May sales boost was particularly notable in Seattle and Portland where sellers who listed in the first half of the month stand to gain the biggest price boost — 2.5 percent in Seattle, 2 percent in Portland — over the area’s average. To apply this analysis to their own home, sellers can use Zillow’s Best Time to List tool to estimate how much listing timing will influence the final sale price in their neighborhood. Registered Zillow users access the tool by clicking the “Sell Your Home” tab on the home details page of their home, and obtain valuable information to pair with the expertise of a local real estate agent when determining the best time to put their home on the market. 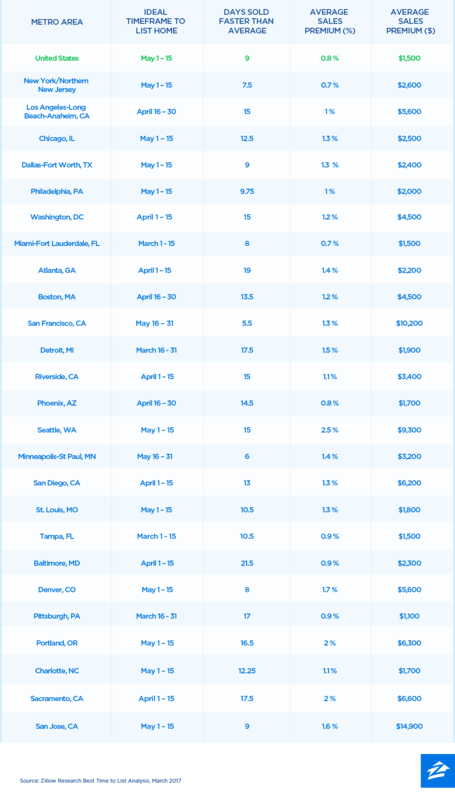 Here’s a look at ideal times for listing in some of the top U.S. metros. Catharine Neilson is a PR Manager at Zillow, where she supports the Zillow Group Mortgages and Zillow Rentals communication programs. Strategic, proactive and creative, Catharine brings years of experience developing consumer facing PR campaigns on regional and national levels.